While we were at our friends' house for a church breakfast event a while back we noticed that one of his metal stools was broken at one of its cross supports. The stools were old and used more as auxiliary seating, but when another friend saw it he said, "you know, I could help you fix that." It turns out the guy has a welder and is fairly accomplished with working it. 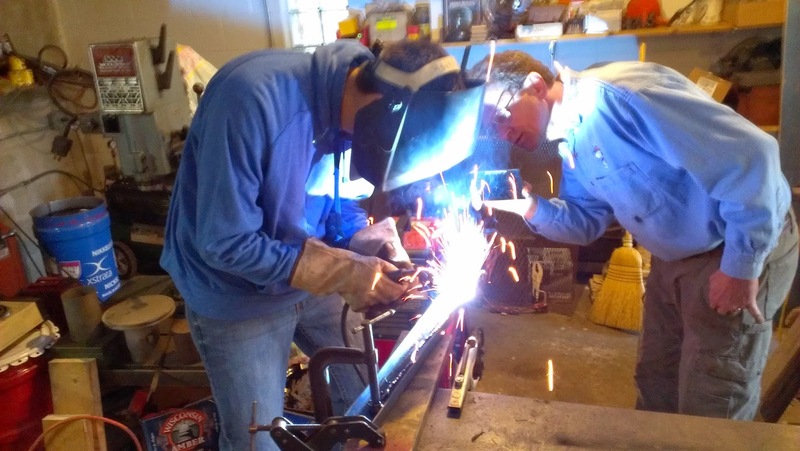 When the mention of a "men's ministry welding event" was brought up, we all kind of agreed that it would be fun, educational and kind of cool. 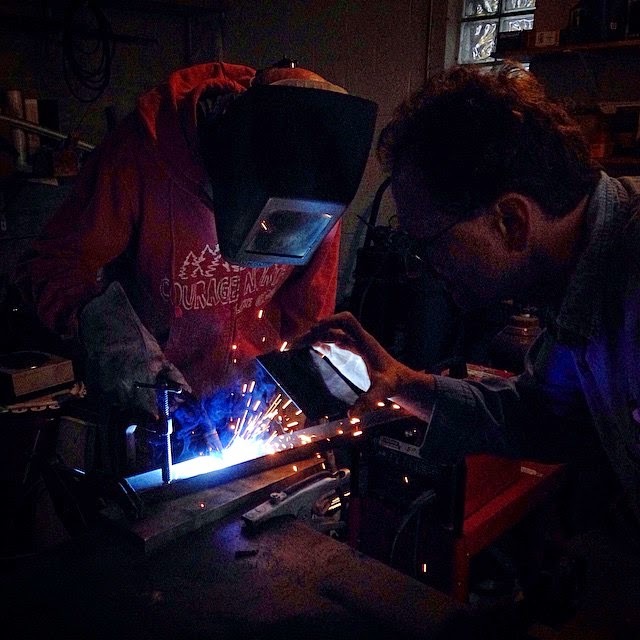 Welding, like many trades, is a specialty skill that you just don't see a lot of people doing. Welders are expensive and I'm guessing, fairly pricy to maintain and operate. Any time you're using Argon gas, steel that is stored in a coil, and electricity that requires its own circuit, well, there's a reason not everyone has one in their garage. Claude is the king of tools. He either has every one-use tool a person ever needs, or "knows a guy" who can get it for you. For example. when I mentioned that I had a couple of combination Master Locks that we'd forgotten the combination on, he said he knew a guy who he could get a bolt cutter from. He brought it one Sunday and, well, snip, snip and they were done. He's no nonsense and would give me the shirt off his back if I needed it. The four of us got to his house on Thursday evening and after a few minutes of catching up, he started to explain some facts about welding that I never knew. One of them was that an Arc Welder actually creates an electrical arc that generates the heat to melt the steel. When I asked what the temperature was at the weld point, I was told it was about 2800 degrees Fahrenheit, which was fairly mind blowing. Add to this the fact that I've never heard of an electrical arc that was a good thing and well, the uneasiness factor ratcheted up a bit. He passed out 5" X 5" darkened glass panels so we could watch him demonstrate how to weld a straight line without going blind. He mentioned the light generated at the weld point is on par with staring at the sun. Again, no comfort in that statement. I was beginning to think that this had all sorts of ways to go bad. Fortunately, we were under the guidance of someone who not only knew what he was doing, but was also very safety conscious. Eventually, Claude fired up the welder and welded a line, then another and another. After a few different techniques were described, he said "Okay, who's next?" At this point I was just a little freaked out. The combination of the sound, the sparks, the apparent heat and the fact that we were messing around with "arcing" electricity was, I'll admit, a bit unnerving. I liken it to the time when I had Ben and Sarah watching me drill something with my high-speed drill. They were freaked by the loudness and ended up covering their ears and running from the basement. I kind of felt the same way. At the same time, the combination of fire and steel and electricity and smoke had my interest piqued. The pyromaniac in me came to my rescue. After some shrugs, Brad said he'd take the first whack at it. He adjusted the welding helmet and dove right in. Neither his, nor any of us other first-timers' lines were quite as straight as our friend teaching us, but none of them went to waste. Brad admitted it was hard to see where you were going and was told to get closer to the fire. When my turn came I took the electrode, said a quick prayer that I wouldn't become a bad part of the arcing electricity, and then put the helmet on. After a few initial rough lines, I started to get the hang of it. True to Claude's advice, I could see much better when I got my (helmeted) face right close to the fire (or arc). The more I did it, the more comfortable and less fearful I became. After we were done, I felt I had gained a basic understanding of something I knew little about. Not a life skill perhaps, but a skill nonetheless. And so it is with so many things in life that I'm finding as I get older. There's three stages to anything that is outside my comfort zone or anything "new" to me. The first is patent rejection. It is the "I can't do that" or the I'm not comfortable with that new thing, skill or routine change, mentality. Once I've committed to doing it, the second reaction is fear. "I'm not doing this right," or "What if I do something badly or wrong?" This is the most debilitating one because if the experience does go badly, even once, some people just quit. The old adage that anything worth doing is worth doing badly applies here. The third stage is comfort and satisfaction. Looking not on what we've done wrong, but what a little patience, effort and practice will get us. Plus along the way, you usually meet some new people and have a life experience to look back on. As I get older, I need to keep the first point in check so I don't miss out in getting to the third point. Because part of life is the fire, the sparks and the smoke. And sometimes, to see where you're going, you just gotta get closer to the fire. P.S. After an hour or so, we had fixed Brad's stool up as good as new.